So, what’s the difference between terrazzo and polished concrete? The difference between terrazzo and polished concrete is the cement-to-aggregate ratio. That’s probably the biggest difference anyway. Cementitious terrazzo is minimum 70 percent marble-chip material and 30 percent cement matrix (with a Portland cement binder). This is pretty much the opposite of regular concrete, which is around 70 percent cement (including fly ash or slag) and 30 percent aggregate (sand and rock). When placed, terrazzo is poured and troweled about 1/2-inch thick over a low-strength concrete bed. It is then ground flat, honed, and sealed with a penetrating solvent-based sealer. Terrazzo must be waxed to achieve the shine that the owner is expecting. With polished concrete, we produce the shine with our diamonds, not through an applied wax finish. We also use densifiers to make the floors harder and more abrasion resistant. With terrazzo, we do not. Will it feel different to us when we grind and polish terrazzo? The main difference when working on terrazzo is that it’s like grinding and polishing an exposed aggregate floor, not a sand or cream finish like on a regular, power troweled surface. Once those specific differences are understood, and we start with the right diamond grit, the grinding, honing, densification, polishing and stain protection application will be similar to a polished concrete job. The floors are very high maintenance in terms of labor, time and cost. The floors are always dull and hazy looking due to increased wax buildup. Waxing and stripping is not a very “green” way of maintaining our buildings. The idea of maintaining terrazzo using our polished concrete techniques was music to his ears! He could definitely see the difference between terrazzo and polished concrete. Concerns about polished concrete seem to be centered on how slip resistant they are and the lifetime maintenance cost. 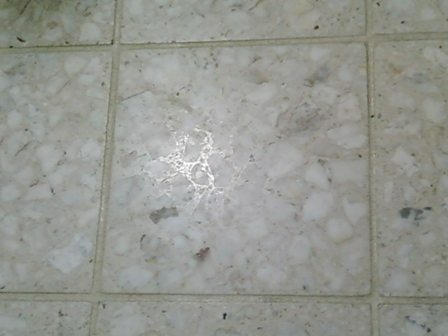 A natural polished floor (with no wax required) looks clear and shiny, and everyone knows that shiny floors are extremely slippery, right? This very common misconception can be handled by walking into your local Lowe’s, Home Depot or Walmart stores. These particular floors show that polished concrete has more slip resistance than waxed terrazzo floors. Take a look the next time you’re in there and you’ll be sold on polished concrete. The difference between terrazzo and polished concrete is simple. The overall outcome of polished concrete over terrazzo will be a better looking, higher performing and lower cost floor. The difference between terrazzo and polished concrete starts to become a little more clear. What are some other benefits of polished concrete vs terrazzo? There’s no longer a need to purchase products to wax and strip your floors. You’ll no longer have pay for labor to have your floors stripped and waxed. You’ll enjoy the reduced maintenance costs due to faster daily or weekly maintenance. Polished concrete floors can be stained and even embedded with a company logo. The possibilities with polished concrete are too numerous to count. The advantages of polished concrete over terrazzo are simple. Be sure to have a look at our polished concrete image gallery. Hopefully, our guide: The difference between terrazzo and polished concrete has been helpful to you. If you’re in the market for a polished concrete company from Northwest Arkansas polish your concrete in your commercial building, industrial building or residential home, please give the professionals at Glossy Floors a call. We service all residential, commercial and industrial floors in and around Northwest Arkansas, Tulsa, Oklahoma, and Missouri. We would love to help explain the difference between terrazzo and polished concrete to you in person. If you would like to know more about the difference between terrazzo and polished concrete. please feel free to contact Glossy Floors at any time. We also have a low price guarantee: Show us a written bid from another polished concrete flooring company and we’ll match it!